Whilst the NBA betting market is generally a very strong one, there are definitely some inefficiencies to exploit. Whether it’s vocal fanbases overvaluing their teams or playoff juggernauts that are bored with the regular season, not all 30 teams can live up to punter’s expectations. We analyse the 5 worst teams against the spread this season and why punters should look to keep fading them. In addition to disappointing on the court this season, the Lakers have also been dreadful from a punting perspective. They are a miserable 38.6% against the spread, covering only 27 of their 71 games. This includes a particularly dreadful record as a favourite, where they are 16-26-1 ATS. Interestingly enough, the Lakers are also the worst side in the NBA when it comes to overs. They’ve gone under the total 60% of the time, another number that punters could profit from significantly by blindly following. Professional bettors often note how the general public loves to play overs and favourites. Given the Lakers terrible record in both areas this season, it’s safe to say their exuberant fan base is over-inflating their value in the market. With nothing to play for anymore, punters would be best served fading the Lakers the rest of the way. This starts against a competitive Brooklyn side at home next time out. Whilst the Warriors have had another solid season record-wise, they still aren’t cashing spread tickets for punters. They find themselves second worst in the association, going 29-40-1 ATS this season. They’ve been particularly poor as a home favourite, covering only 12 of those 33 instances. Their mark as a road favourite isn’t that much better, covering at only a 43% clip. This tells me that Golden State is doing just enough to win these games but isn’t too worried about the regular season. Now, this isn’t an indictment on Golden State’s post-season chances. They have comfortably the best roster in the NBA and relatively weak conference competition, making them strong value at $1.45 for the title. A profitable strategy for punters could be to fade them for the rest of the regular season (starting against Indiana on Friday) before backing them during the playoffs. As with Golden State, the Raptors are consistently winning games but just aren’t winning by the margin that punters expect. They’ve been a poor 30-40-1 this season, making them just 42% against the number this season. This is particularly true when they enter a match as favourites, covering only 22 of those 57 instances so far. Interestingly, they’ve fared significantly better as underdogs and actually have a profitable 8-6 ATS record. Given their late-season failures in recent seasons, I think Toronto is definitely focused on the playoffs this year. They have as good a chance as anybody to come out the East and are currently 2nd favourites for the title at $10. That said, the playoffs are still a month away and I don’t see their regular season form changing. Starting with a strong OKC side next in their next matchup, Toronto are worth fading during the regular season. 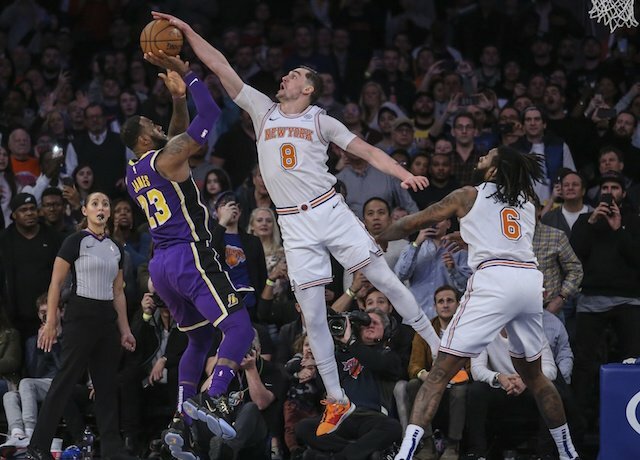 Even with some of the exorbitant spreads the Knicks have received, they’ve still managed to disappoint punters this season. They’ve been statistically the 4th worst side in the Association, covering just 29 of their 71 contests. Breaking this down, they’ve gone 26-33-3 ATS as an underdog and a measly 3-6 when favoured. They’ve covered just 12 of 33 games at home, going a more respectable 16-20-1 on the road. Just like the Lakers, the Knicks have one of the more outspoken fan bases in the NBA. They’ve been through a lot of heartache in recent years and should be commended for sticking with their squad. That said, they continue to overrate the Knicks in the betting market each and every year. This usually starts out with an overinflated season win total (under 29.5 has already cashed this season). It has translated into regular season games as well, with the Knicks particularly struggling ATS at the Garden. Punters should be looking to fade New York at home the rest of the way, starting with Utah tomorrow. For fans and analytics gurus alike, the Hornets have to be one of the most frustrating teams in the NBA. Despite a solid point differential, they’ve gone 30-38-2 ATS this season, good for 5th worst in the Association. They’ve particularly struggled as an underdog, going just 14-19-1 against the number. This is especially true as a road underdog, where they’ve gone 11-16, good for 4th worst in the NBA. Whilst things looked promising for Charlotte a few seasons ago, recent losses to Miami and Philadelphia may have been the final nail in their coffin. Having already struggled against the number this season, I don’t see decreased motivation helping either. Having also featured on our top teams for over backers, punters could find value fading Charlotte and the under the rest of the way. This theory will be put to the test on Friday as they play host to the Timberwolves. There are some logical reasons why each of these NBA sides have struggled ATS this season. Huge and vocal fanbases have overvalued the Lakers and Knicks in the market. On the other side of things, Golden State and Toronto are clearly focused on the playoffs. Some punters are catching up to these trends, however I think each of these sides are worth fading for the remainder of the regular season.